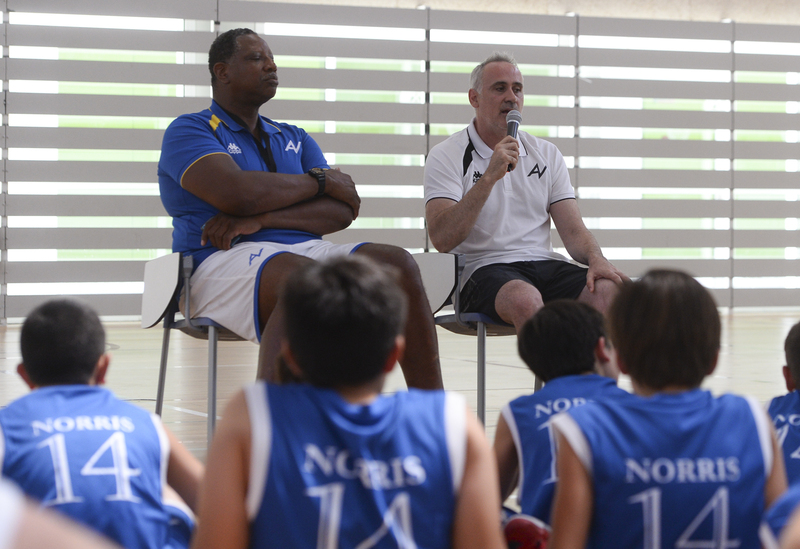 This is the 3rd day of The Audie Norris Basketball Camp and today we had the pleasure of listening to Jose Luis Galilea, an International NBA Scout. Galilea was also an ex-teammate of Coach Norris with F C Barcelona where they became friends and remain friends til this day. Today at the camp Coach Norris want to focus on specific skills for each position on the basketball floor,and Jose Luis Galilea took charge of training the positons for the point guards, 2 guards and the small forward positions. Galilea led a series of ball control exercises, hand changes, how to create space with the dribble… and individual technique, skills that are very useful in today’s basketball. Coach Norris took the post players and put them through a series of drills to help improve their footwork and movements in the low post and high post. The kids asked a lot of questions about the NBA, the salary cap, the free agency market, what teams look for when recruiting players and the Draft. There were a lot of interest about the idiosyncrasy of the NBA. The main questions was how do you scout a player? Galilea responded by saying “A scout looks a lot closer in a players background how he carries himself outside of basketball, they interview a lot of people to find out who this player is that their will invest millions of dollars into, the already know how the young man plays. You have to take into account how he carries social networks, his family life… It is also interesting to know if the player trains well, because the best players train 365 days of the year” .